Natasja Kensmil is a Dutch born painter of Surinamese extraction. Here for the fist time in Ireland she presents two bodies of work and a suite of new drawings. There is a Creole nature to the work, a mixing of beliefs that is as unsettling as it is engaging. Kensmil appropriates images of deceased European monarchy to build strong, powerful and eerie paintings. From the Romanovs to the Hapsburgs to the Virgin Queen herself, Elizabeth 1st, Kensmil’s monarchs, in the midst of their pomp and splendour, are ravaged by their own mortality. Painted in modulated tones, with thin glazes of colour these are massive physical paintings. Their presence begs the question of death and our relationship with those gone before us. They seem to mock our secular stance and bid a re-welcome to the realm of spirits. 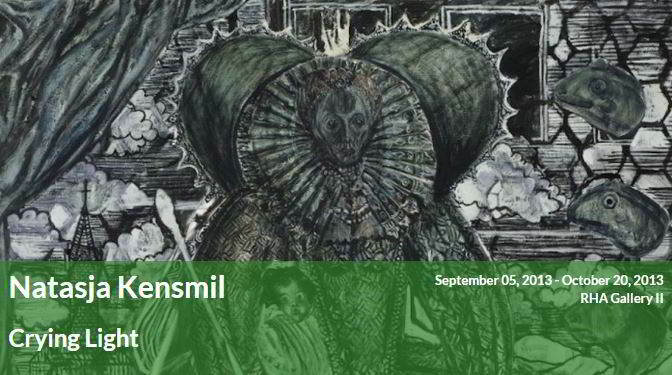 In a second suite of work, entitled Sleeping Beauty Kensmil’s subject is infant mortality. Swaddled and cradled these tiny spirits also challenge our reassured Western optimism when it comes to life and its potential. For Kensmil the past ancestors seemingly are seeking a role in our present. A full colour catalogue will accompany this exhibition, courtesy of the andriesse eyck gallery, Amsterdam.